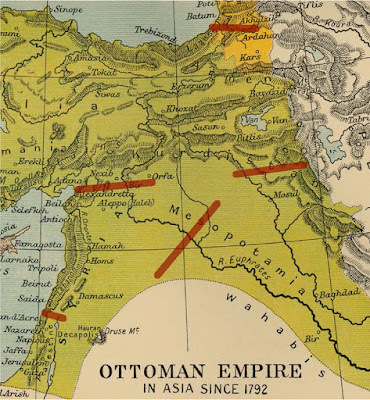 The material in this post was initially presented, in somewhat different form, as part of a round table at the 2016 Middle East Studies Association Conference titled "Sykes-Picot at 100': Mapping, Migrants, and Myths." 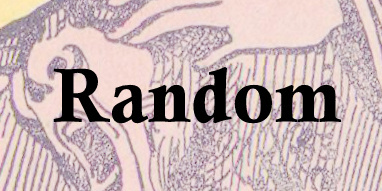 The revised paper is available for download in pdf from here. It has become increasingly commonplace to present borders, particularly in the Middle East, as an ugly embodiment of the way colonialism, nationalism and the modern state disrupted preexisting networks of social relationships. By extension, these borders have, for many, become symbols of the ideological blindness of the officials who initially drew them, their supposed indifference to an earlier "'circulation mode' of affiliation" that was "[c]haracterized by fluidity and mobility." 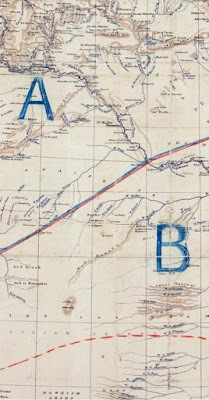 This post looks briefly at the way the political regimes that created new borders in the Middle East after WWI acknowledged and tried to mitigate the potential disruption they would cause. It is striking that in the 20s and 30s many of these borders were actually considerably more open than they later became. Crucially this was not just through a lack of resources to control them but actually by design. Which is to say that by and large it was not the creation of borders themselves that proved disruptive but instead political tensions between the governments on both sides them. Consistently across the region, political and military disputes gave borders that were initially intended to be quite permeable the fortified disruptive character we associate with them today. The Iraq-Syrian border, for example, which ISIS famously presented as a symbol of the region’s “Sykes-Picot division,” was only delimited by a League of Nations commission in 1932, and it remained open for nomads to cross relatively freely until Syrian-Iraqi political tensions led to its closure in the 1980s. The fortified border which ISIS saw as a product of a century-old political order, in other words, was only about three decades old. In this regard the Iraqi-Syrian border is hardly unique. 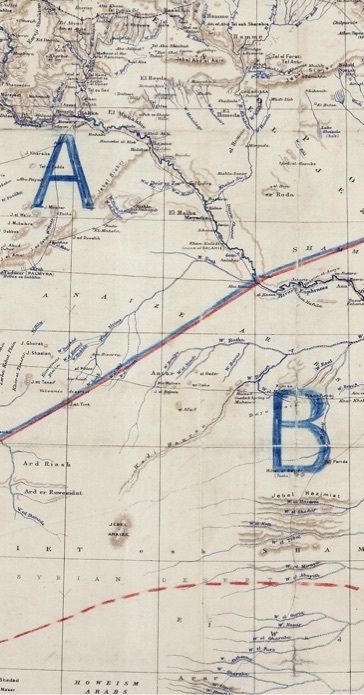 A quick tour of some documents and scholarship related to the history of borders in the Middle East reveals that many evolved in the same way. Across the region, similar measures were initially taken to limit the disruption new borders would cause, and in many cases these measures broke down for the same reasons. There shall be no interior customs barriers between any of the above mentioned areas. promote economic and educational unity throughout Mesopotamia and Syria... [and] reflect more fully than ever before, the close relations in language, customs, and trade between these parts of the former Turkish Empire. Likewise, the commission said of Turkey and Armenia that " Those areas have been held together for several centuries, and have a great number of close ties of all sorts, the delicate adjustment of which can be best accomplished under one power." 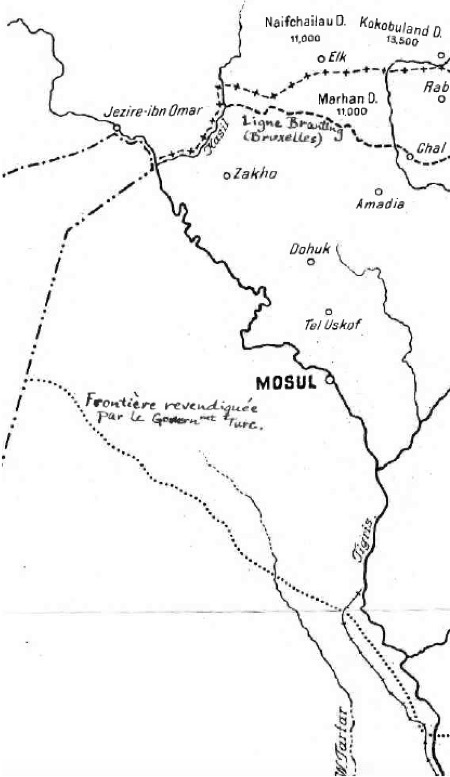 The League of Nations report regarding the dispute over Mosul between Britain and Turkey also helps reveal the extent to which the institution that epitomized the modernizing logic of the European state system appeared to believe that borders could and should be porous. In making their cases to the League, both Britain and Turkey insisted that if the new Iraqi-Turkish border was drawn in the wrong place it would cause deep and traumatic social and economic disruption, but if it was drawn in the right place, these disruptions would be minimal, and could be managed with an attentive and responsible border regime. 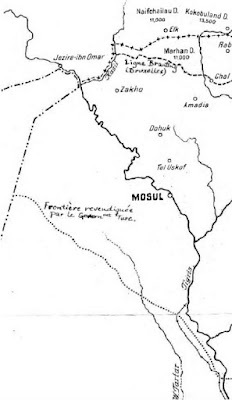 If the disputed territory is assigned to Iraq, its inhabitants should be given full freedom of trade with Turkey and Syria, and moreover, facilities should be afforded to the Turkish frontier towns to use the Mosul route for exporting their produce and importing manufactured articles. It’s also interesting that when it came to trade and nomadic migration, the League assumed that political forces, not borders, would be the main factor in transforming traditional patterns of life. Forcible resettlement of nomads by both the Turkish and Iraqi state, they suggested, would curtail migration, while the construction of new railways and roads would transform economic patterns in the region. In other words, other aspects of the modern state would prove more disruptive than the borders that came with them. Freedom of grazing and nomadic migration was written into all major boundary agreements in the 1920s. These terms were assiduously observed by local frontier officials, even to the point of risking conflict with demands from the center. All the inhabitants, whether settled or semi-nomadic, of both territories who at the date of the signature of this agreement enjoy grazing, watering or cultivation rights, or own land on the one or the other side of the frontier, shall continue to exercise their rights as in the past. They shall be entitled, for this purpose, to cross the frontier freely and without a passport and to transport, from one side to the other of the frontier, their animals and the natural increase thereof, their tools, their vehicles whatever the mode of traction, their implements, seeds and products of the soil or subsoil of their lands, without paying any customs duties or any dues for grazing or watering or any other tax on account of passing the frontier and entering the neighboring territory. As to how these agreements actually played out, it seems that across the British-French frontier that divided Syria and Lebanon from Palestine, the impact of the new border was initially minimal. Cyrus Schayegh writes that “travel documents could be obtained at minimal cost from French administrators...." but even where new border posts were erected "[p]eople mostly continued to cross between these posts without papers." Similarly, Asher Kaufman describes Zionists freely crossing the border between French and British mandates in order to hike Mount Hermon, and notes that as of 1941, according to one participant, "these trips did not require cross border permits because the border was wide open and they never met a Lebanese or Syrian policeman." Indeed, other provisions waived the requirement for documents completely in some circumstances, with one stating: "Pilgrims making the annual pilgrimage to the Nabi Yusha marabout at the end of Ramadan shall be exempt from formalities of a passport or laissez-passer." Subsequently, both Schayegh and Kaufman cite a series of political developments as being decisive in bringing this once-open border to a close. In 1938, the British built a fence built a fence to stop gun-runners following the outbreak of the Arab revolt. Then, in 1941 they deployed the Transjordan frontier force to stop Jewish immigration to Palestine. Finally, in 1948, two and a half decades after its demarcation, the border closed more dramatically, taking on the impassable and militarized character it has today. The Turkish-Syrian border experienced a similar transformation. 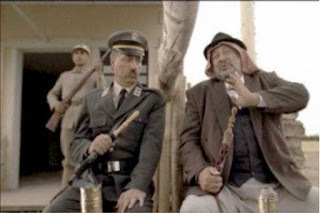 In keeping with the now prevalent narrative of borders, the Turkish movie Propaganda, for example, tells the story of the disruptive impact of the new border that came into being with the Turkish annexation of Hatay in 1939. It offers a dramatic parable of neighbors and lovers separated as their village is torn apart by an arbitrary and unnatural line. But in fact, after 1923 the Turkish-Syrian border was relatively open... until the ongoing dispute over the province of Hatay caused both sides to take measures that made it increasingly closed. First, before 1939, the French set up new border controls to try to prevent the infiltration of Turkish guerrillas seeking to liberate the province. Then, after 1938, Sarah Shields relates how the Turkish government subsequently imposed new tariffs and transport restrictions as part of a deliberate effort to sever the regions ties with Syria and incorporate it into Turkey. In World War Two, wartime security concerns led to new restrictions, imposed particularly severely against religious minorities. Finally, in the 1980s, after September 12 coup, the Turkish government for the first time laid mines along the border in order to prevent potential Syrian support for illegal left-wing groups in Turkey. Mining the border was a deadly and disruptive result of cold war politics and ongoing Turkish-Syrian tensions caused, in part, by the 1939 Hatay dispute. First was the "Open Border" between 1921 and 1937. In this period there was a fence, but the border was still relatively easy to cross. As in the other parts of the Middle East, villagers could cross to farm their fields on the other side, traveling up to 15 miles, with an easily obtainable pass. Until the Soviet Union cracked down on religion men from both sides attended Friday prayers on the Turkish side with an Imam living on the Soviet side. Then came "Fortifications" between 1937 and 1956. As one village stated: "When the authorities over here started their search for Trostkyites these trips to the other side were over for once and for all." Following new regulations imposed in 1937, "no one even dared look in he direction of Turkey," while any communication between families on either side, including singing funeral laments, was banned for fear it could be a form of "sending messages to the enemy." Finally, there was the era of "Sealed Border" from 1956 to the end of the Cold War in 1988. Thirty years after its creation, the Turkish-Georgian border came to resemble the Berlin Wall. What was it like? "Well, there were 8 meters up to the fences where the ground was cleared. Behind it there was a fence with an alarm system and then there was a second fence. Soldiers and dogs patrolled [the area] between those two fences." Only after 1965 could Soviet citizens send letters across the border, and even then it took between 3 and 6 months and the letters were heavily censored. In this period you could also request a visa to visit family members but it took 5 to 10 years and you might lose your job for applying. The story of the Turkish-Georgian border, in other words, is inseparable from the story of Turkish-Soviet relations. Without Stalin's paranoia or Turkey's inclusion in the Atlantic pact, the border might have been in the same place, but its impact on people's lives would have been very different. Repeatedly, borders drawn in the immediate aftermath of the first world war took on a life of their own during the course of the 20th century. The officials who first drew them recognized they would proved disruptive, and tried to ameliorate this disruption, but later political developments consistently undermined these efforts. Bad neighbors, it seems, make bad border regime, and bad border regimes disrupt networks and communities. It is always tempting to blame today's problems on the ideologically-driven failure of our predecessors to anticipate them. The more discouraging possibility is that earlier generations of leaders or thinkers may have anticipated the challenges they faced quite clearly but still been unable to find a solution.